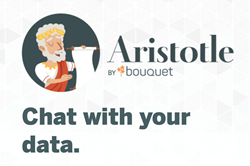 Make data fun with Aristotle; your new AI-Analyst. “Aristotle answers questions by voice and text for any Salesforce user to easily get deep insights powered by Einstein Analytics,” says Francois Lopitaux Sr. Director, Product, Einstein Discovery at Salesforce. Bouquet.ai is an enterprise software company located in San Francisco that powers Aristotle, the innovative virtual data analyst that turns data analytics into meaningful conversation. There is a growing need to make big data more accessible and intuitive for enterprises due to the amount of data available and the speed in which companies aim to operate. By applying artificial intelligence to power smart conversations about data, Bouquet.ai can transform the way B2B companies, essentially in any space – healthcare, technology, real estate, education, etc – can rely on virtual assistants to make decisions. Aristotle seamlessly integrates to standard messaging tools and voice-activated interfaces such as Slack, Skype and Microsoft Teams to help enterprises get the answers they need for success, 24/7. From either a desktop or the convenience of a mobile device, Aristotle delivers smart and flexible analytics through natural language, therefore changing the way companies now receive and understand information. The company recently secured $1.5 Million in seed round funding from US and French business angels and Canadian firm Tjene Capital, and was selected as a rising startup to join Plug and Play’s Fintech Accelerator Program. They also conducted two case studies with CData Software, a leading provider of data access and connectivity solutions, and ProQuest, Michigan-based global information-content and technology company. CData’s use of Bouquet.ai included a successful proof of concept with data from Salesforce Einstein Analytics and saw not only exceptional performance, but also quality support. Bouquet.ai had CData Software embed drivers for the full range of supported data sources to ensure fast connectivity and enable CData to answer as many questions about their data as fast as possible. With the drivers working under the hood, Aristotle can now talk to more than 120 of their data sources and answer exponentially more questions. In regards to ProQuest, Aristotle was selected by their sales team to provide analytics on data from Salesforce and an Amazon Redshift data warehouse. Aristotle allows the building managers and planners at Tjene Capital, a real estate management and technology consulting firm, to better manage their properties by perusing and sorting through thousands of data entries immediately on site, right from their pocket. Bouquet.ai will be exhibiting at Dreamforce 2018, the most innovative software conference of the year, from September 25-28, 2018 in San Francisco You can also find Adrien Schmidt, Co-Founder and CEO of Bouquet.ai, and Marios Anapliotis, Co-Founder and COO, and the rest of their team next at Ascent Conference in New York City and Web Summit in Lisbon, Portugal. 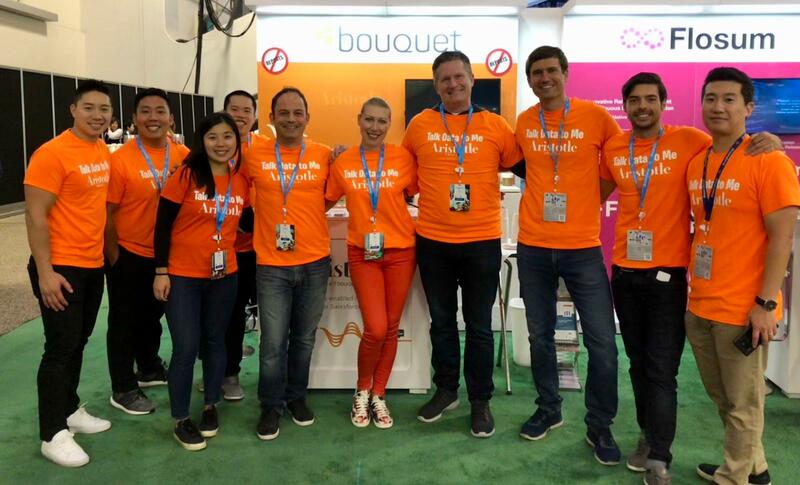 “We have seen exponential growth since we debuted at Dreamforce last year and we are excited to be back to showcase not only Aristotle’s’ improved software capabilities, but the echelon of engineers, marketers, strategists and team players who make this all possible,” says Adrien Schmidt, Co-Founder and CEO of Bouquet.ai. If you would like more information or to be connected with member of their team for interviews or additional queries, please email Melissa Lee at press@bouquet.ai or call 978-886-7259. Request a demo today by visiting their website at http://www.bouquet.ai. Salesforce, Einstein Analytics, Dreamforce and others are among the trademarks of salesforce.com, inc.
Bouquet.ai is changing the way data analytics is received, shared and understood via their AI-chatbot, Aristotle. Founded in both Paris and San Francisco in 2015, by Adrien Schmidt, CEO, and Marios Anapliotis, COO, Bouquet.ai is providing the first tool powered by artificial intelligence to allow analysts and executives to have a conversation with their data in the fastest and simplest forms possible. Like a friendly conversation with, Bouquet.ai makes it easy to get to know your data by making access to KPIs, answers, and analytics simple and natural. Their team is a mix of entrepreneurs, product managers, data experts and developers who are on a mission to give people a fast, enjoyable way to access the right information immediately where they need it. Whether it is on the road, in a meeting room, or in the hallway, Aristotle is the trusted resource.